While a lot of the aspects of landscaping like water, fertilisers, harsh chemicals are commonly associated with sustainability, one of the most important but typically forgotten is sustainable landscaping And power. Interestingly right from laying the landscape to maintenance, we use power. However, this is typically ignored when it comes to conservation. With proper planning, good choice of equipments and landscape design you can conserve power in your lawns, and achieve sustainable landscaping. There is a host of lawn care processes, which typically require the use of power equipment. While power tools and equipment make life easier on a very large scale, many of the mid-sized and small lawn owners too opt for such equipment, and do not offer much in sustainable landscaping. There are many low cost, power efficient alternatives to lawn care equipments that can be used. 1. Lawn Mower: Gasoline mowers are very common. The primary reason for the popularity of such mowers was the reduced effort required to mow lawns. Traditional manual push powers were bulky and difficult to handle. However, with advancements in technology, the design and weights of push mowers have gone down significantly. Although it still requires some physical effort to mow the lawns, they are lighter in weight, better in efficiency and offer a power efficient alternative to gas lawn mowers. There are a new generation of electric mowers too that can help keep the physical exertion low and still deliver high quality cut, thereby delivering sustainable landscaping. 2. Grass Trimmer: This is another tool that is usually gas powered. You can certainly reduce your gas bills on trimmers by opting for manual or electric trimmers. This sustainable switch is a lot easier with trimmers than with lawn mowers. 3. Hedge Trimmers: While using commercial grade gas-powered trimmers is a great way to keep the shrubs and bushes in shape, you can achieve the same results with unclipped hedges or with electric trimmers. These are power efficient and are very convenient to handle too. 4. Gas Blowers: Blowers are needed to blow away the dead leaves and cut grass from the lawn and keep it clean. While it is savvy to use blowers to clear the lawn, the traditional rake is a more interesting alternative. The fun and pleasure of collecting the plant leaves using rakes is something that a gas blower cannot replicate. Also using rakes, or even brooms, you can actually move the plant wastes back to nearby flowerbeds to act as mulch. You need not collect all the waste and dispose them always. Sometimes not using blowers allows you to rearrange the waste as mulch, which again enhances sustainable landscaping. 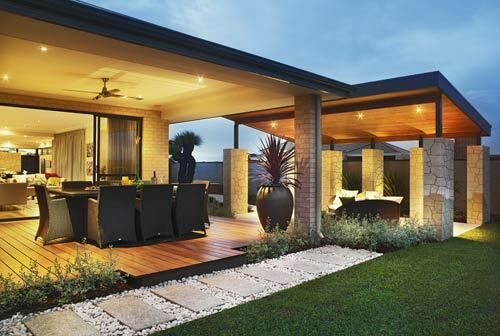 Lawn lighting is another major source of power consumption in any landscape design. It could be small lights along the pavements or decoration lights under trees and special plants – all of them consume power. To address the lighting issue, you can switch to alternative source of energy – the solar energy. There are many solar powered lights and lamps available in the market. These come in all shapes, sizes and colours to match your overall landscape design. With these lights, you do not have to lay down extensive cable network to connect the lights to a power supply. Besides, the solar cells are usually zero maintenance, which means that you just place them in the lawn and forget about them for a long time. Lastly, with advancements in technology, the solar powered lights are not that expensive anymore too making it more affordable to achieve sustainable landscaping.